An interesting way to make your turnout control automatic (or at least semi-automatic) is to use magnetic Reed switches mounted between the ties of your track such that when a magnet (attached to the bottom of your loco) passes over it, the switch activates the turnout automatically. Set up your wiring for each turnout according to the schematic as seen above. Then attach a magnet to the bottom of your locomotive. As the loco (from the left or right side of the mainline) passes the Reed switch approaching the turnout, the switch will activate the solenoid to switch the points in the proper direction so that the locomotive will automatically be lined up for the mainline. 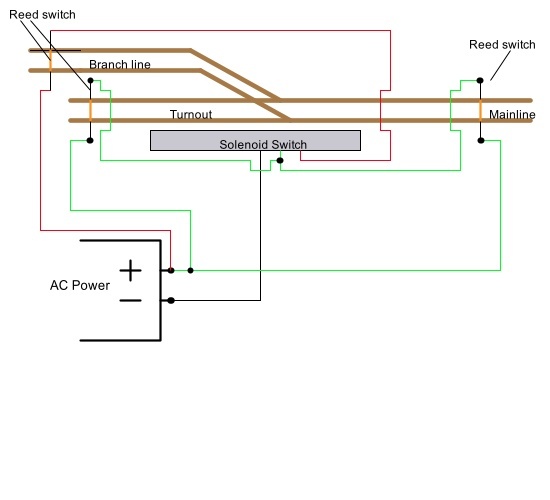 If the locomotive approaches the turnout from the branch line, the Reed switch on that line will activate the solenoid to make the points line up for the branch line. 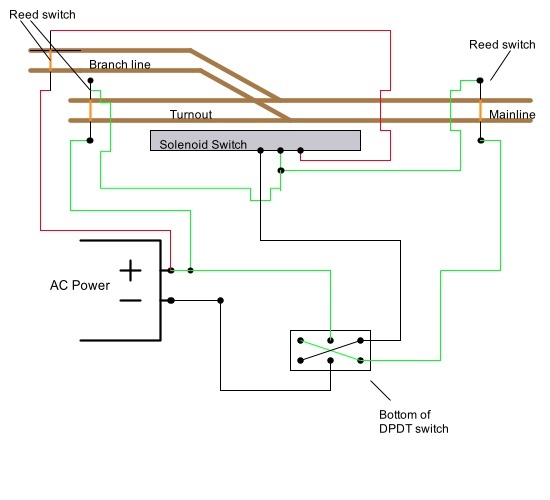 The only problem is that if you want the loco to go from the right side of the mainline to the branch line, you will have to either operate the switch manually or use a DPDT switch to reverse the polarity as I've indicated on the second schematic below. After your train passes onto the branch line, you will then have to remember to throw the DPDT switch back to the original position to restore automatic function of the switches for the mainline. One additional note is that you should also have a magnet attached to the bottom of the last car in the train as well, so that if your train on the branch line backs out onto the mainline the Reed switch will be activated to line up the points properly before the car (caboose) gets there. Also make sure that your Reed switch is mounted and raised up a little between the ties such that when the magnet on the train passes over the switch, the magnet and switch come very close together, if not touching; although you don't want them to hang up on each other either. From "Turnout Control" to "All About Turnouts"
From "Turnout Control" to "HomePage"